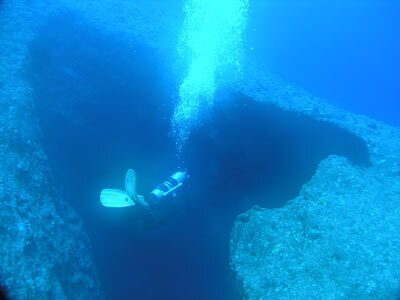 Michael McFadyen's Scuba Diving - Blue Hole - Guam Guam is a place many people may have heard of, probably because of World War II, but most people do not really know where in the Pacific it is located. Guam is a territory of the United States of America and is located in the western Pacific Ocean. It is the largest and southern-most of the Mariana Islands. It is approximately 2,500 kilometres from Guam to Japan and Port Moresby, Papua New Guinea. It is a bit west of north of Sydney, albeit 5,283 kilometres away. 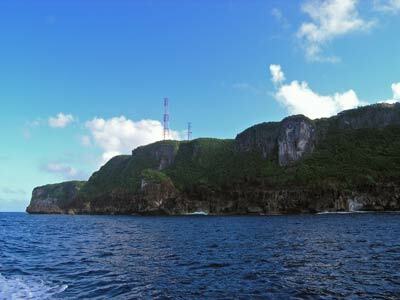 Apra Harbor is the only protected anchorage in Guam and is located at the westernmost part of the island. It is not a huge harbour (in fact is appears to be an artificial harbour with the northern side man-made), but big enough to be home to a US naval base (with nuclear submarines). 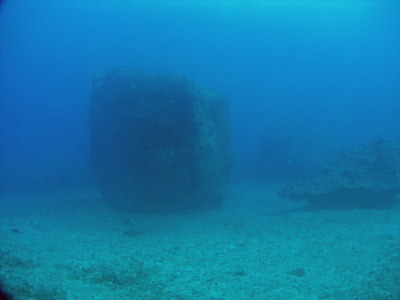 Inside the harbour are a number of wrecks, the best known being the World War I German ship SMS Cormoran and the World War II Japanese ship Tokei Maru. Outside Apra Harbor there are a number of dive sites quite close and there are even a couple of sites inside the harbour. 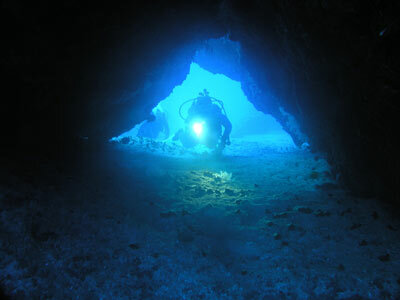 This article is about the most popular site outside the harbour, Blue Hole. Although the harbour is man-made, the southern headland is a very dramatic geographic feature called Orote Point. 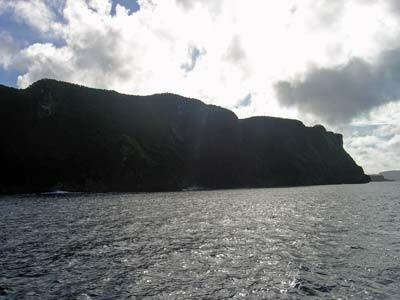 The cliff here is as high, if not higher, than North Head in Sydney Harbour. After heading across the harbour, the dive boat turns left and heads south. The dramatic cliff runs for quite a while along this section of coastline. Blue Hole is located only a kilometre south of the harbour at GPS Reading N13° 26' 11.4" E144° 37' 33.9" using WGS84 as the datum. At this location there is a mooring. The mooring is in about 18 metres on the top of the reef wall. 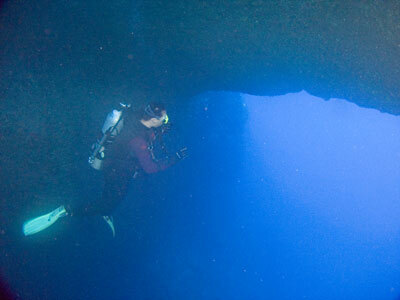 As you have probably worked out, Blue Hole is a hole in the top of the reef that drops down and exits onto the wall. 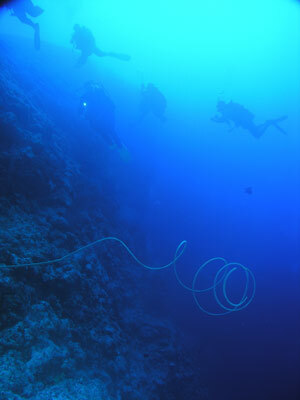 Once you enter the water, you descend down the mooring line and straight away you will see the Blue Hole. It is about 20 metres long and 10 metres wide. At 18 metres you enter the hole and straight away you can see the bluish glow coming from the exit below. 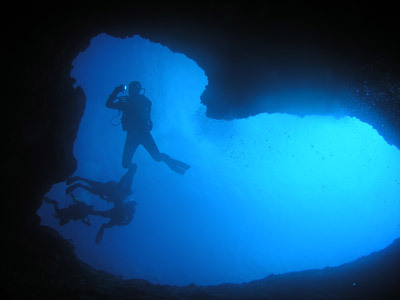 As you head down, look back up at the other divers following you. You can get some great photographs if you are careful with your exhalation bubbles. The hole drops to about 40 metres before you can exit. The exit is huge, the opening extends all the way to the bottom of the hole at about 55 or perhaps 60 metres. The wall here is shear and runs back up to the reef top at 18 metres. The bottom of the wall is at least 80 metres from what I could see. Normally there is a current so you drift with the flow and your boat will pick you up when you surface. On my dive here the tide was running back towards the harbour. Outside the hole the wall has some nice gorgonias, but mostly these are deeper than the depth you will need to be at for the dive. Some of the gorgonias are huge, probably two metres across. 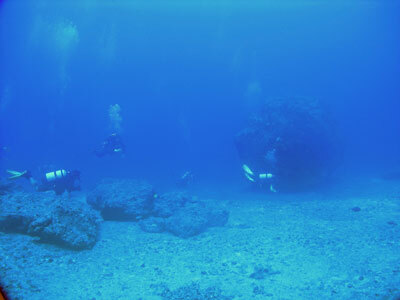 However, other than that, there is little live coral or sponge life to be seen on this dive. As the visibility here is normally excellent, at least 30 metres, you will be able to see a long way up and down the wall. As such, it is easy to see what is coming up as you drift along and change direction to make sure you see all the feature of the site. The current is not extremely strong and you could swim against it if you wanted to. You will have to start ascending almost as soon as you exit the hole as you will have reached about 45 metres, meaning you only have about eight minutes before you will enter decompression. If you are careful, you can stay out of decompression by gradually ascending. The wall seems to be patrolled by reef sharks. 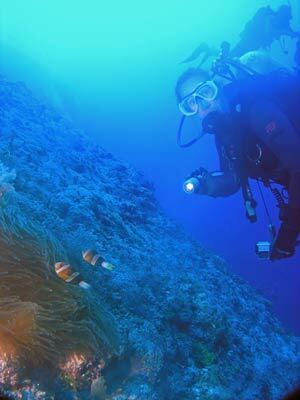 On my dive here I saw a white-tipped and a black-tipped reef shark. Along the wall there are moray eels, some anemones and clownfish and other smaller fish. After about 10 minutes you will still be at 30 metres but soon have to come up onto the top of the reef. A few minutes later you will be at 20 metres and this is the top of the wall. For the next 20 minutes the depth stays roughly the same. 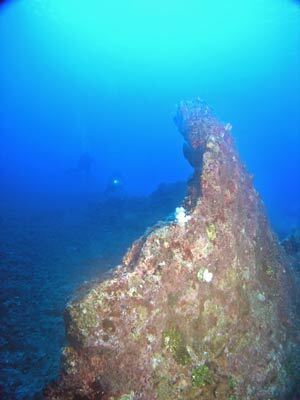 As soon as you hit the top of the wall you will see that the reef top is very wide, at least 30 metres. Back towards the shore it gradually rises back up towards the surface. On the top there are lots of huge boulders. Some of these are as big as a garage. In some places the boulders are bunched together and form small swim-throughs. After about 35 minutes you will need to move closer towards the shore so that you can get a bit shallower. The wall here is a gradual slope. In places along here there are some small holes and cracks. 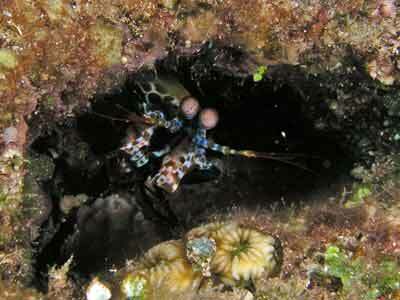 Check them out, we found a mantis shrimp in one. There are also more sharks patrolling this part of the reef. Finally, you will need to start your ascent. To do this you will have to swim out at right-angles to the reef to get away from the shore. This is so the dive boat can safely collect you. Do a safety stop as you swim out, but make sure you do not go too far. Your guide should have a safety sausage to send up, but if you have separated from the guide, send up your own. This is a nice dive, with a very exiting start, a great vertical wall and some shark-life. It also has excellent visibility. It is a pity that there is not more coral and fixed marine life. Probably the best available reef dive in Guam done by the dive shops. Video shot by Kelly McFadyen during our November 2011 trip to Guam.